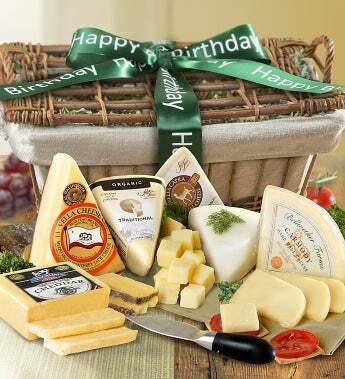 Send Happy Birthday greetings to your favorite foodie when you give our gourmet, sophisticated, premium Cheeses from the fertile California wine region. All natural and expertly created, the Bellwether Farms Carmody and Sierra Nevada cheeses that are made using time-honored traditions and techniques. Sierra Nevada cheese combines the perfect mix of lavender and fennel pollen which gives this fresh California artisan goat cheese a sweet flavor. It’s a delicious gift worthy of a very special someone. Send Happy Birthday greetings to your favorite foodie when you give our gourmet, sophisticated, and satisfying pairing of premium Cheeses from the fertile California wine region.